We study the sources of racial and ethnic disparities in income using de-identified longitudinaldata covering nearly the entire U.S. population from 1989-2015. We document three sets ofresults. First, the intergenerational persistence of disparities varies substantially across racialgroups. 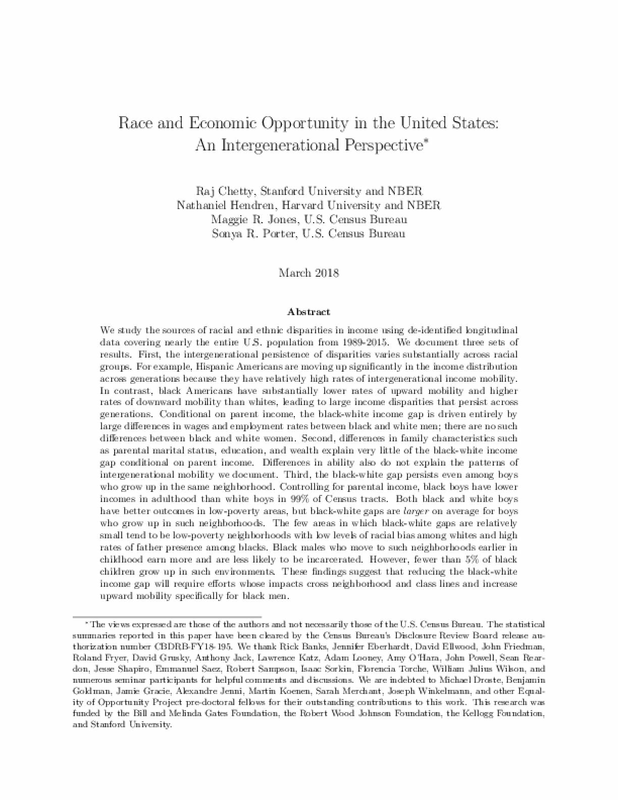 For example, Hispanic Americans are moving up significantly in the income distributionacross generations because they have relatively high rates of intergenerational income mobility.In contrast, black Americans have substantially lower rates of upward mobility and higherrates of downward mobility than whites, leading to large income disparities that persist acrossgenerations. Conditional on parent income, the black-white income gap is driven entirely bylarge differences in wages and employment rates between black and white men; there are no suchdifferences between black and white women. Second, differences in family characteristics suchas parental marital status, education, and wealth explain very little of the black-white incomegap conditional on parent income. Differences in ability also do not explain the patterns ofintergenerational mobility we document. Third, the black-white gap persists even among boyswho grow up in the same neighborhood. Controlling for parental income, black boys have lowerincomes in adulthood than white boys in 99% of Census tracts. Both black and white boyshave better outcomes in low-poverty areas, but black-white gaps arelargeron average for boyswho grow up in such neighborhoods. The few areas in which black-white gaps are relativelysmall tend to be low-poverty neighborhoods with low levels of racial bias among whites and highrates of father presence among blacks. Black males who move to such neighborhoods earlier inchildhood earn more and are less likely to be incarcerated. However, fewer than 5% of blackchildren grow up in such environments. These findings suggest that reducing the black-whiteincome gap will require efforts whose impacts cross neighborhood and class lines and increaseupward mobility specifically for black men. Copyright 2018 by Equality of Opportunity Project. All rights reserved.